The British Conservatives in a coalition with the American Republican party and the Israel lobby have set their agenda and won the political propaganda battle in a pull to the right. First Brexit and a few months later the upset victory of Donald Trump. Israel was the primary recipient of the praise of the new man in the White House. Bibi Netanyahu got his revenge on the Obama administration and the Iran nuclear deal. The US Embassy moved to Jerusalem, by executive order a major accomplishment of Barack Obama was sent to the scrap hep of history. Just recently the arrogance of the right-wing political block in Israel set a new frontier: the Nation Law incorporated in the Basic Law of the Jewish State of Israel, its constitution. Jones will lecture on "left anti-Semitism, the Middle East and the Labour Party." The Jewish Labour Movement scoring Jones appears to be a high-profile instance of a new push endorsed by Israel's government to ensure that Palestine solidarity "instigators" are "singled out" from so-called "soft critics" of Israel. According to The Jewish Daily Forward, the strategy - jointly developed by the Reut Institute and the Anti-Defamation League (ADL) - "calls for a big tent approach that accepts progressive critics of Israel" while also demanding "an all-out assault on leading critics of Israel, sometimes using covert means." "The instigators must be singled out from the other groups, and handled uncompromisingly, publicly or covertly," the Reut-ADL report states, according to The Forward, which obtained a copy on condition it not publish the entire document. The Jewish Labour Movement, a pro-Israel organization within the UK's main opposition Labour Party, appears to be on board with this strategy. Al Jazeera's recent undercover documentary The Lobby revealed the Jewish Labour Movement's close ties to the Israeli embassy, as well as its campaign against BDS, the boycott, divestment and sanctions movement. We have seen unwarranted attacks on British Labour leader Jeremy Corbyn. I have posted a comment recently, and the attack goes on unabated. Could this be another leadership battle within the Labour party? Thus the narrative is carried forward in a new attack on the British Labour party. Earlier in March, US media accused Russian president Putin of anti-semitism. This meme had been used occasionally before during and after the Maidan revolt in Kiev, Ukraine in 2014. If you heard Putin say "Russia's Jews aren't worthy to be called Russian" would you take offense? I would. That's an affront to common sensibility. It certainly sounds anti-Semitic to me. When Senator Richard Blumenthal heard Putin imply that sentiment in a recent NBC interview he reacted strongly: "Repulsive Putin remark deserves to be denounced, soundly and promptly, by world leaders." The only trouble is that Putin never made that statement. Blumenthal was responding to NBC's translation of Putin's remarks in a TV interview with Megyn Kelly. But Putin didn't speak the words NBC claims he did. NBC distorted his message. I don't know if it was done intentionally with political motive or if it was just incompetent journalism. But NBC's mistranslation set off a chain reaction. Newser.com remarked that Putin critics have "assailed the leader for his apparent implication that Russian Jews aren't true Russians." Anti-Defamation League's Jonathan Greenblatt stated, "President Putin bizarrely has resorted to the blame game by pointing the finger at Jews and other minorities in his country." He added, "It is deeply disturbing to see the Russian president giving new life to classic anti-Semitic stereotypes that have plagued his country for hundreds of years, with a comment that sounds as if it was ripped from the pages of the Protocols of the Elders of Zion." The American Jewish Committee tweeted: "President Putin suggesting that Russian Federation minorities, be they Ukrainian, Tatar, or Jewish, were behind US election meddling is eerily reminiscent of the Protocols of the Elders of Zion." When Boruch Gorin, a well-known rabbi in Moscow, traveled for the first time from Russia to the United States, a US Customs officer asked him whether he was Russian. "I said, `No, I'm not Russian -- I'm Jewish,'" Gorin recalled Monday, 27 years after the exchange at John F. Kennedy International Airport in New York. The semantics behind the exchange, Gorin said, are the reason that local Jewish groups remained largely indifferent to a remark about Jews aired Sunday by Russian President Vladimir Putin that to foreign ears sounded anti-Semitic. In the interview with NBC News, Putin said that Russians who allegedly interfered with the 2016 US presidential election perhaps are "not even Russians," adding "Maybe they're Ukrainians, Tatars, Jews, just with Russian citizenship. Even that needs to be checked. Maybe they have dual citizenship. Or maybe a green card. Maybe it was the Americans who paid them for this work. How do you know? I don't know." Across Eastern Europe, this linguistic distinction has plagued how officials' statements are perceived abroad -- not least in Poland. Amid rising diplomatic tensions with Israel over rhetoric on the Holocaust, the Polish attorney general, Zbigniew Ziobro, said in January that "after Nazi Germany attacked, millions of people were murdered in occupied Poland, including 3 million Poles." That seemed to be in reference to the 3 million non-Jewish Poles killed during World War II, suggesting he did not consider the 3 million Polish Jews who were exterminated to be Poles. But in reality, the word "Jew" in Polish is used to refer primarily to ethnicity, not to nationality. Putin's answer in the NBC interview was translated into English without the nuance crucial to understanding it, said Gorin, who is a senior aide to Russian Chief Rabbi Berel Lazar, the head of the Chabad movement in Russia. Lightning strikes twice or history repeating itself to serve a nefarious goal? Facing condemnation from allies and foes alike on Capitol Hill, President Donald Trump was outnumbered even in the Oval Office. Top aides gathered to convince the president to issue a rare walk-back of the comments he'd made raising doubts about US intelligence conclusions of Russian election interference as he stood alongside Vladimir Putin. Vice President Mike Pence, National Security Adviser John Bolton and chief of staff John Kelly stood united in the West Wing on Tuesday in their contention that the commander in chief had some cleanup to do. They brought with them words of alarm from Defense Secretary Jim Mattis and Secretary of State Mike Pompeo, as well as from a host of congressional leaders and supporters of the president for whom Trump's public praise of Putin proved to be a bridge too far. Israel sets a new narrative, changes the definition of anti-semitism. Of course I personally was labeled an anti-semite recently @BooMan. Completely unfounded, and with not a single post linked where there would be evidence. Simply I try to view the situation of Occupied Territories and the right for a Palestinian State through International Law, UN Security Council Resolutions and the fundamental right for people to choose their government, political leaders and live in an independent state. The Democratic party has become unhinged after the unexpected defeat of HRC and seek Russian agents in a new era of McCarthyism. Reminds me of the 1960s and the anti-Vietnam war protests and demonstrations. Under Nixon this attitude led to bloodshed at Kent State University. The fervor of nationalism is a short way from fascism and intolerance. How about a specific case about what to do. I can vote in the November elections in NJ, but my two main choices are Bob Hugin (R) and Bob Menendez (Likud, opponent of 1st Amendment, i.e., pro anti-BDS legislation. He claims to be a D). I wasn't even going to bother to get a ballot, but then I decided that I should at least vote for some other candidate just to make a point. Most of the alternatives are Libertarian nonsense, and some that make no sense at all. But then there is Madelyn Hoffman for the Greens, who seems to have been to Syria and has a better idea than the others of what is going on (which might not be saying that much). Until something else comes up, I think I'll vote for her. I got over the idea that "bipartisan" compromise is the solution to congressional "gridlock", when I accepted the possibility that very little that they have agreed was either socially acceptable or valuable to me. That is a lot of wasted "institutional knowledge." "Gridlock" might well be a little appreciated "saving grace" in these times, the prerequisite to my mundane survival, not to mention the course of human history in the hands of 535 voting members + one "disabled" oligarch. More interesting as the case may be, or exciting, are the consequences of effecting de facto, mulit-valent composition of oligarchs and "sovereign persons" who are compelled by either greed or necessity or, well, public interest to form both short- and long-term "coalitions" that assure enactment of pandered [!] constituent promises. No one party, no one person. So I close my eyes and waver my hand when I cast my ballot for predictable unpredictability --not a party, not a person-- knowing I can correct the error, if any, in two years time. Pressure mounted on Mr Willsman to stand down from Labour's NEC after leading MPs including Deputy Leader Tom Watson, MPs Luciana Berger and Gloria Del Piero all launched scathing attacks on his remarks - made at the July 17 meeting of the Party's ruling body which approved a controversial new antisemitism code of conduct, instead of the internationally recognised definition of Jew-hate. Both Mr Corbyn and party General Secretary Jennie Formby have claimed to be "militant opponents" of antisemitism, though they said nothing as he spoke. Ilford North MP Wes Streeting tweeted: "Glad to see prominent figures from the Labour left disowning Willsman, but what about those in the room? "They saw it and did nothing. Maybe now understand why many of us speak out publicly. The party's leadership have only ever been shamed into action on antisemitism. Depressing." Columnist Owen Jones, who has been a staunch advocate of Mr Corbyn, wrote: "After his comments, there's no way I'll vote for Pete Willsman for Labour's NEC. "I'll proudly vote for the other eight excellent Labour left candidates. I won't vote for someone who undermines the struggle against the disgusting disease of antisemitism." The singer and activist Billy Braggwho has a big following in the Labour party and who was recently criticised for comments siding with Mr Corbyn on the antisemitism issue said Mr Willsman should stand down from the NEC. Karen Pollock, chief executive of the Holocaust Educational Trust, said Mr Willsman's rant was "horrifying - not only for its content, but by the fact that the Labour leader and general secretary sat by, witnessed these disgusting, indefensible comments and said nothing". The Tory party conservatives that brought us Brexit and the Trump presidency ... just facts! See all my previous tracking of Cambridge Analytica - Brexit Vote - Steve Bannon - UKIP - Erik Prince - Robert Mercer - Paul Singer - Mark Zuckerberg - Abu Dhabi - EmerData - and most likely a contribution by Israel's covert group of Mossad operatives Black Cube. Did Ahmadinejad really say Israel should be 'wiped off the map'? Some might question why Ahmadinejad's precise words are important. I don't. I've never been a fan of misplaced precision. Also I am a bad typist. I located and watched the complete subtitled, two-day interview between Megyn "$20 million Survivor" Kelly and Putin. You will recall, US media did not broadcast the complete interview. Why is that? I think, producers learned from prior errors the political advantages to be gained by putting words in the mouths of 'bloody foreigners'. Consider any tract from European "scriptures," for example, Thucydides, History of the Peloponnesian War: Two paragraphs, one transcription: koine->modern Gr, three translations (Jowett - 1881, Hobbes - 1843, Cowles-1910), two third-party annotations, to convey the idea that war is glorious, "democratic" even. To hear this history rehearsed, for that there be inserted in it no fables, shall be perhaps not delightful. But he that desires to look into the truth of things done and which (according to the condition of humanity) may be done again, or at least their like, he shall find enough herein to make him think it profitable. And it is compiled rather for an everlasting possession than to be rehearsed for a prize. Where is "truth"? Is it in the nominative, datative, ablative, or genetive form of a noun? It appears that English-speakers have the greatest difficulty "parsing" nuance. This is what I've learned apart from 40 years home study in US law practices and customs. Over four hours, de Leeuw was strip searched, deprived of her phone and other property and denied access to the Dutch embassy or legal assistance. She was then deported. Her colleague Pauline Overeem experienced even more severe treatment. He acknowledged some of the fiercest criticisms of his leadership on the issue, saying the party must show more empathy, should have reacted more quickly to cases of abuse, and should have done more to consult the Jewish community. But he described as "overheated rhetoric" the argument made by three Jewish newspapers in unprecedented joint front-page editorials that a government run by him would pose "an existential threat". The Jewish Chronicle, Jewish News and Jewish Telegraph each produced similar front pages for their Thursday editions attacking the Labour party's decision not to fully absorb an internationally accepted definition of antisemitism into its code of conduct, and its wider record on the issue since Corbyn became leader in 2015. There was limited reaction from Jewish groups, with some privately expressing annoyance they had not been briefed in advance about an article released shortly before the start of the sabbath. Gideon Falter, the chairman of Campaign Against Antisemitism, dismissed what he called "a vague and meaningless article". He said that Corbyn had "again preached to Jews that he is right to have rewritten the international definition of antisemitism" and was not taking on board the concerns of the Jewish community. However, the shadow Treasury minister Lyn Brown tweeted that the article was "the words of the man I know". She added: "Jewish people who are feeling concerned must be listened to." As well as the issues over the definition of antisemitism, Corbyn must find a solution to the situation concerning Hodge and the Dudley North MP, Ian Austin, who face disciplinary charges after dissenting over antisemitism policy in ways the party claims were abusive. Letters released in a series of tweets by Hodge show her lawyers, Mishcon de Reya, repeatedly asking for further details of the alleged offence and information about any witnesses to the confrontation in the House of Commons on 17 July. Part of a multi-pronged attack on Labour leader Corbyn ahead of the next election. The establishment seeks every opportunity to rid itself of Jeremy Corbyn, his ideals are not mainstream are an existential threat to the AngloSaxon identity. Especially for allies the US and Israel. Geez, one should be "blessed" with a deputy like Tom Watson. Reminds me of Hillary Clinton given the opportunity as Secretary of State under Obama and established her legacy at the expense of Obama's ideals. John Kerry's attempt to patch over the shortcomings ... fell short due to a NSC run by the Pentagon and the Intelligence services. The following headline really means: "Israel is our ally and goes beyond Corbyn's vision of establishing an independent Palestinian State .... just ask the achievement of Middle East special envoy Tony Blair. ○ Why was Tony Blair being paid by the UAE while working as Middle East envoy? Labour's deputy leader, Tom Watson, says that the party will "disappear into a vortex of eternal shame and embarrassment" and render itself unfit for government, unless it calls an immediate halt to damaging arguments over antisemitism. Speaking to the Observer, Watson called on Jeremy Corbyn to drop without delay internal inquiries into two Labour MPs - Margaret Hodge and Ian Austin - who both lost family members in the Holocaust and now face possible disciplinary charges after furious outbursts over the party's stance on antisemitism. Watson also said Corbyn should immediately adopt the full International Holocaust Remembrance Alliance (IHRA) definition of antisemitism, along with all its examples - a move the party continues to resist - in order to prevent the row engulfing the party throughout the entire summer period. IHRA sets its goal as a Holocaust education project ad a broad definition of anti-semitism. It's supported by right-wing groups part of the Islamophobia lobby, spreading fear of foreigners and the Islam. Weakness in a party will always be exploited by the opposition. The controversy in Labour on the stance vs Israel and Palestine will always be present in the debate about anti-semitism of some of its members. Britain remains one of the safest places to live as a Jew on the entire planet. That doesn't mean there's no anti-Jewish prejudice here. It's just that there's a great deal less of it than some people want you to believe. That's true for now, but how long will it last? 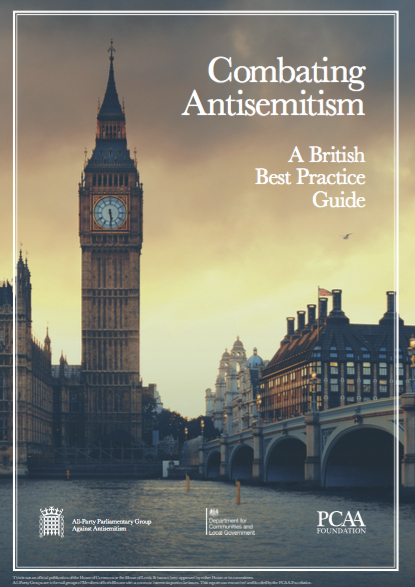 Thanks to a Jewish communal leadership and a Jewish press which have merged Jewish interests in Britain with the need to defend the interests of the State of Israel, we are set on a path that risks turning fake antisemitism into real antisemitism. What we are witnessing could be an on-coming, self-inflicted tragedy for the Jewish community in Britain. Calling it out now is the best way to stop it happening. For those of you who've not been following every twist and turn of this saga let me bring you up to speed on the recent developments and the longer term background. This week's "existential threat" is just the latest ratcheting up of the rhetoric against the Labour Party leader Jeremy Corbyn over his alleged failure to deal with the alleged epidemic of alleged antisemitism running rife in the party under his leadership - allegedly. It all began three years ago soon after Corbyn's election as Labour party leader. What started off as allegations that he was allowing antisemitism to fester in his party unchecked have evolved into direct accusations that Corbyn is himself antisemitic. I'm yet to see a credible piece of evidence that demonstrates that antisemitism is rife in the Labour Party. That doesn't mean it's non-existent but the claim made in the joint editorial that the "stain and shame of antisemitism has coursed through Her Majesty's Opposition since Jeremy Corbyn became leader in 2015" does not stand up to scrutiny. 'Write and Record' were the last words of Jewish historian Simon Dubnow as he was murdered by the Nazis in the Riga ghetto on December 8th 1941. It is an injunction we should take to heart and add a third imperative - we should Write, Record and Compare. If there is one thing that Zionists hate, it is when analogies are made between Israel, Zionism and the Nazis or conclusions are drawn from the Holocaust. It is a cast iron rule, that only the Zionist movement is entitled to compare or equate its opponents with the Nazis. Sir Vince Cable has held secret talks with a former aide to Tony Blair on the possibility of forming a new Lib-Lab alliance to counter Brexit - and Jeremy Corbyn. The Lib Dem leader discussed the idea of a new political `configuration' over dinner last month with Philip Collins, a speechwriter for Mr Blair when he was Prime Minister. In March, respected Times pundit Mr Collins, a fierce Labour critic of Jeremy Corbyn, said Labour and the Lib Dems shared much of the same history and ideology and their refusal to get together made no sense. It was time to tear down the 'wall of vanity' that divided them, he suggested. Worthwhile read ... takes a lot of thought to appreciate depth of article especially with a biased position of the White House under Trump rule. Two bullies enforcing one another and the Arab states of the Gulf have positioned themselves with Israel to counter the influence of the Shia Republic of Iran. The expeditionary military campaign in Iraq, Libya and Syria was a failure for the Sunni global jihadists funded and armed by above mentioned outside powers. Destroy - conquer - divide - chaos - control (DCDCC). The current Israeli government has an obvious interest in the survival of the Hamas government in Gaza. The reasons are clear to anyone who sees beyond the rhetorical smoke screen. Instead of one powerful Palestinian entity, there are currently two weak ones, and they are very hostile towards each other. Israel is not interested in a long term arrangement, both for ideological reasons (the arrangement will endanger the idea of "Greater Israel") and for political reasons (the arrangement will create a coalition crisis). The current Israeli government is being sustained by the status quo. The fact that the Gaza Strip is controlled by an extremist Islamic organization that advocates terrorism and the destruction of Israel is an important bargaining chip. Had the Gaza Strip been controlled by a more moderate organization, it would have been far more difficult to explain both Israel's political intransigence and the blockade imposed on the strip. With Hamas in Gaza and Palestinian Authority in the West Bank, everything is simpler. Hamas is too strong, Mahmoud Abbas is too weak, that way there is no partner for negotiations, and until one emerges, we can continue to build settlements and destroy Israeli democracy, in order to ensure that a suitable partner will never emerge. The broad action against `leftist' Labour leader Jeremy Corbyn is part of the Israel playbook and is coordinated from inside the Israeli Embassy in London. Get real, the motivation is NOT anti-semitism but Corbyn's clear position on the right of Palestinians to have their own sovereign, independent state.